Monday, April 30, Martha and I drove to Nashville, Tennessee. There we unloaded many thousands of Christian books, Gospel magazines, biblically relevant tracts and such like. We place the literature into five shipping barrels. The agent for Caribbean Shipping Service will haul them to Miami, whereupon they will be placed on an ocean freighter. About a month after leaving port, the drums will arrive in Georgetown, Guyana, South America. 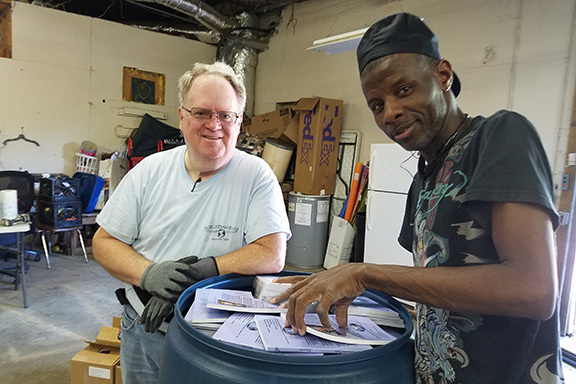 Brother Nigel Milo and the Amelia’s Ward Church of Christ in Liden, Guyana will retrieve the materials and distribute them to churches of Christ throughout the tropical nation. Tuesday, May 1, Martha and I finished driving to Maywood Christian Camp outside of Hamilton, Alabama. For two days, others and we helped make ready for the beginning of our annual missionary retreat. As important as cleaning, etc. is the fellowship we experience with those especially devoted to carrying the Gospel abroad. Wednesday evening, Martha and I made an unannounced visit with the Bear Creek Church of Christ in Bear Creek, Alabama. These good brethren support the original World Evangelism work as well as the labors for Christ in which we engage. For several days, I have been putting together the May edition of Gospel Gazette Online. Rebecca Rushmore, my daughter, proofs it for me, finding several mistakes that I miss. Finally, late Wednesday night, Gospel Gazette Online was officially published for the world to see and to use. It is available without charge to the user for anyone and everyone around the world who has access to the Internet. Now in the 20th year of continuous online publication, thousands of pages are preserved in the Archive besides the content of each new monthly issue of the journal. We keep busy, and we like it that way. Martha and I want little else than to be useful tools in the hands of our Almighty God. Sunday morning, April 15, Martha and I drove from Winona, Mississippi to Greenwood, Mississippi. It was my privilege to assemble once more with the brethren of the West President Church of Christ, and it was my honor to present a message from God’s Word during worship. I preached about “Bible Authority”—a fundamental message to Christian faith and practice. Nothing else I do is more enjoyable for me than to teach, preach or write biblical lessons. I set out to glorify God and to edify all present, including myself. After lunch on the grounds following worship, Martha and I pointed the car toward the southside of Jackson, Mississippi. That afternoon, we met with the elders and deacons of the Siwell Road Church of Christ; the elders oversee Martha and me as we endeavor to serve our Lord Jesus Christ. That evening, we worshipped with our dear brethren at that congregation. We were treated to supper at an eatery in Clinton, Mississippi after the assembly dismissed. Hence, we lodged in Clinton as well because I needed urgent dental attention, speedily scheduled for early Monday morning in Byram, Mississippi. As it turned out, I needed a root canal plus medicine for an infection and for pain. Somewhat drugged, I passed the responsibility for driving to Martha. First, she drove two hours to Winona so we could hookup with our coworkers who returned from several weeks abroad in Asia; also, we repacked our suitcase, added more items to the minivan and headed for Florence, Alabama—Martha again at the wheel. It was her job to drive most of Monday, and apparently it was my job to whine and complain! Finally, we arrived in Florence at Heritage Christian University—the site for the next three days of the annual Indian Missions Conference. After setting up a table of books and such, we made our way to the Quality Inn. Coincidentally, about the same time, brother Ricky Gootam and his son Justin drove into the same parking lot. We will be attending the program together and speaking on the program. It has been a long day, and the days ahead will be filled from morning to evening. The weeks ahead call for us haul literature to Nashville, Tennessee for shipment to Guyana, South America; attend a missionary retreat in Hamilton, Alabama; and take Martha to Ocala, Florida for the graduation from high school by one of her granddaughters. Of course, it’s time to work on both publications—Gospel Gazette Online and The Voice of Truth International. Life is full and well appropriated. God be praised; we hope to serve our Lord faithfully on earth and happily anticipate an eternal home in God’s house.